If there is a ranking of all the items that can be collected, vintage radios surely must show right at the top. What other objects will reward and serve in so many ways? Out of the vast variety of models made, there are still good sets readily available at reasonable cost, while at the other end of the scale there are select pieces which approach in rarity the most famous postage stamp. Thus, the pleasure of owning, restoring, looking at and eventually listening to a radio from yesteryear is easily within the reach of everybody. 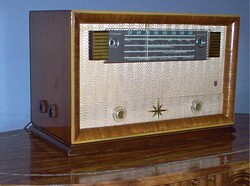 Vintage radios are “active” collectibles. No true collector will be able to restrain his or her urge to restore, to make that “attic find” perform to its original specifications. And that opens up an almost unlimited range of possibilities. As radio technology represents the beginning of modern electronics, the innards of an older radio are generally still simple enough to be understood by a truly interested novice. With some reading up on the subject and the help of an experienced collector friend many of the components and their interrelation become comprehensible. The first success, which could be more stations tuned in, a clearer sound, that offending hum eliminated, etc. cannot be far off. This simplicity of the basics makes radio technology an ideal teaching tool for children as young as at kindergarten age: A crystal set or a very small radio operating on “potato power” are well suited to experiment without carrying any health risks for the exploring youngster. This is not to say that radios, even the first ones, are primitive consumer items. If one follows the development of the radio to today’s stage, one encounters many a famous name. Modern electronics, kick-started by the wish to find a way to transmit voice and music wirelessly, is serious science. It is not uncommon to find today’s practitioners of this science within the ranks of avid collectors. In vintage radio clubs across the world they mingle with beginners. They eagerly pass on not only their own technical expertise, but quite often provide historical details. These, so far mainly unrecorded, make for fascinating conversations and, possibly more important, ensure the memory of them is kept alive. Bringing a vintage radio back to life is by no means the end of the challenge for a collector. The optics has to be right too. Over the decades, radio “containers” metamorphosed from initially simple wooden utility boxes into attractive pieces of furniture. Specific styles evolved; e.g. we talk about “cathedrals”, “tombstones” and in other less descriptive terms. Old radios justifiably lay claim to being bona fide antiques. In an attractive cabinet, they often serve as the centrepiece, the principal item in the layout of a home. Easy to accept that a serious collector, beyond becoming good at electronics, also needs to sharpen his skills in woodworking, bakelite repairs, lacquer refinishing, etc. Crowning it off, when all is done, the collector may self-contentedly lean back in his favourite recliner, listen to the warm sound from that restored tube radio in the happy knowledge that he made his contribution to help preserve the early history of radio. Space here will not allow to list in any detail the stages leading to commercial radio broadcasting and functioning receivers capable of demodulating signals and to convert the radio frequency into audible speech and music. However, it’s a story well worth reading up on. Just to whet the appetite for further study, a few names from the illustrious circle of scientists and entrepreneurs involved in the radio story be mentioned here: Guglielmo Marconi and others transmitted signals in 1855 using spark transmitters. In 1896 Marconi invented Wireless Telegraphy. The Edison effect, the appearance of an electric current flowing between a heated cathode and an anode in an evacuated tube, was discovered in 1882, though not yet understood. For reasons not explained, Thomas Alva Edison did not follow up on the discovery. John Ambrose Fleming did and patented in 1904 the first electronic rectifier. Lee De Forest invented 1906 the audion tube, a three-element vacuum tube in which the grid controlled the current, which made modern radio possible. De Forest was once indicted – but later acquitted – for mail fraud: He was accused of seeking to sell a worthless device, namely his audion tube! Perhaps not so widely known is that Canadians contributed decisively to the cause. Reginald Aubrey Fessenden demonstrated speech transmission using a spark transmitter in 1900. In 1906 he broadcast the first programme of speech and music. Fessenden also discovered the heterodyne principle of mixing a low frequency signal with a higher frequency carrier. Edward Samuel (Ted) Rogers invented in 1924 the world’s first successful alternating current radio tube. One year later, he introduced the “Rogers Batteryless Radio” to the public. It eliminated all the problems of batteries and gave a clearer sound reproduction as well. An interesting sidelight is that the power cords of Rogers Radios were tipped with special threaded metal tabs which could be inserted into light-bulb sockets – homes in 1925 were not equipped with outlets as we know them today. And it is not common knowledge that Roy Thompson started a North Bay radio station 1931. He believed that owning a radio station would help him sell radios, and he turned out to be very effective in selling advertising. The big money, though, came when he turned his interest to newspapers. (This, and in much more detail, is related in “The Early Development of Radio in Canada 1901 – 1930” by Robert P. Murray. ISBN 1-886606-20-X). By the early 1920s radio technology had evolved to the stage where commercial radio stations were broadcasting to consumers. The receivers used were either crystal detectors or battery operated tube radios. Earphones came in handy for both devices, though the better tube radios would soon progress to a separate speaker. 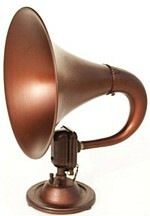 Early speakers were basically expanded earphones that employed a cone-shaped contraption, a horn, to amplify sound. Amplification came at the cost of higher levels of distortion. Improvements made over the following decades eventually led to the permanent-dynamic speaker. Of all the various systems developed, this is still the most used principle today. During the 1920s to the 1950s, often referred to as the golden age of the radio, millions of radios were produced in North America by hundreds of companies. One report has it that in 1929 alone 185,000 sets were sold in Canada. Of these, it is estimated that 69,000 were made here. This latter figure can only be an estimate as the proper “country of origin” is in many cases difficult to determine. Cross-border industrial relations between Canada and the USA opened up the opportunity to import completely assembled sets, partly constructed radios to legally avoid higher customs duty and, of course, produce radios that were properly licensed to be made in Canada by a Canadian company. This radio model, made 1925 – 1927 by the H.M. Kipp Company Limited of 447 Yonge Street, Toronto, is purely Canadian. Kipp emphasizes this in their 1928 catalogue by stating “Exclusively a Canadian Product Originated by Chas. A. Lowry Radio Engineer for the H. M. Kipp Co., Ltd. and produced in Canada”. Model PH-103 made in Canada by Phillips, 1953. 8-tube superhet with RF-stage , broadcast and strong short wave section. Collection Ashis Mukerjea. The “Mercury Super Ten” was a superheterodyne or multi-stage Tuned Radio Frequency radio designed specifically for “Canada, with her peculiar terrain and unusual, and often difficult atmospheric conditions”. (From the 1928 Kipp catalogue). Others, though made in Canada, are of somewhat lesser Canadian authenticity. That includes the 1940 RCA-Victor, model A-21, which features among other things six station pre-sets. 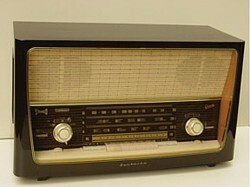 The 1953 Philips, model PH-103, falls also into this category. For collectors and traders alike, this book makes interesting reading. It is best used as a reference to indicate the place of manufacture of a newly acquired radio. In that respect it is encyclopedic in scope. 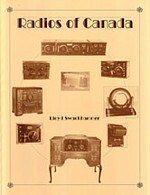 It is also, as one reviewer remarks, “…the first and only book on collectible Canadian radios...”. Unless a collector is determined to restrict his collection to North American radios, adding samples of European products will “just happen”. Initially, this will likely involve the export version of European, mainly German, radios. With growing interest, collecting could extend into sets made for the respective domestic market. The most obvious difference is usually the dial glass – station / city names for domestic and frequency ranges only for export sets. Pre-1945 European radios are rare in North America and not necessarily the best choice for the average collector. From the late ‘40s to almost the 1970s, there are rich pickings for devotees of tube-type radios. Typically, these sets come in a big wooden cabinet that accommodates four or more speakers. Their sound is legendary. The re-allocation of broadcasting frequencies decided upon in Copenhagen in 1948 led in thereby disadvantaged countries to intensified efforts to make the switch to FM an attractive alternative. Advances made in FM technology further embellish the sound experience from these radios. Collectors are aware that the FM band on early European sets often ends at 98 or 100 MHz. 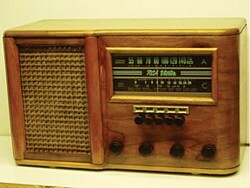 An example of a “big-box” European radio with pushbuttons is this 1960 Graetz “Fantasia 822E”. It measures 26.8 x 15.6 x 12.2 inches (680x395x310mm). In this particular case, the radio is clearly identified and sold as a RCA product. The identity of the actual manufacturer is nowhere to be found. However, knowledgeable collectors will be able to trace it back to its domestic “twin”. In that pursuit, membership at the www.radiomuseum.org is arguably the greatest asset. 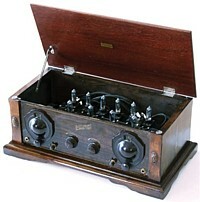 Radiomuseum.org (RMorg) is the brainchild of a retired Swiss businessman and collector. Frustrated by the absence of a comprehensive listing of tube radios and related items, he founded (and bankrolls) a virtual radio catalogue and museum. The aim is to eventually have catalogued all tube radios ever made. The approach is quite unique: Membership is free. However, members are expected to contribute by uploading all relevant information – everyone within his or her means in the form of new models, pictures, schematics, repair experiences, etc. In return, members gain access to the by now huge database. In addition, a team of bona fide experts in the field assists in all aspects of radio technology, restoration, history and other subjects of interest. Not in any way comparable to the usual chat-room, RMorg is on the way to become the only true encyclopedia on a bygone era. As a general rule, newcomers to antique radio would be well advised to curb their ambition to own any radio from the ‘20s and ‘30s. These sets are rare, command high prices and most of those still around are already in the hands of serious collectors. Beyond that, what can one really do with such a radio? Considering their value – provided good condition – the (not yet) expert would be reluctant to get close to it with a soldering iron. For the beginner, there is also the risk to fall for a replica. Another important point: Working with these classic radios requires a certain expertise. Condition and electric principles applied may lead to high, even lethal voltages in unexpected places. More satisfaction will be derived from a radio of later manufacture. Unless it is a very special model with unusual features, radios from the ‘40s onwards can still be acquired at reasonable cost, if lucky even be picked up for free at the roadside on garbage removal day. More likely sources will be garage sales, flea markets, estate auctions and attic or basement of friends and relatives. Often music consoles, because of their size, can be had for picking up. And, of course, there is always eBay. Radios from the ‘50s are likely to come with FM. They are technically advanced and definitely worth being restored and preserved. Components and supplies for the restoration of vintage radios remain generally available. The chance to be rewarded with the original warm sound and the visual elegance of that oldie is good. What if stations switch to digital broadcasting? A concern heard more frequently in recent times. Well, our analog tube receivers will become obsolete. Will they? Not necessarily. People who collect and restore tube radios now for their inherent different, warm sound will not give up their listening preferences. Neither should they. The tube radio is still there, only the signal source changed. Some real radio fanatics may consider building their own, low-power sender (and, let’s hope, not forget to apply for a permit). The vast majority of radio enthusiasts will remember that tube sound can be continued to be enjoyed by playing voice and music recordings through the old tube radio. LPs, reel-to-reel tape recorders, cassette recorders, record players and any other means of analog recording may be rediscovered. Nostalgia comes into it too. Some collectors are already recording live AM broadcasts for future use. Fellow collectors and traders would be wise to recognize that the movement is on.